RSE focus on creating effective, high-quality websites that perform well in search engines and appeal to site visitors. 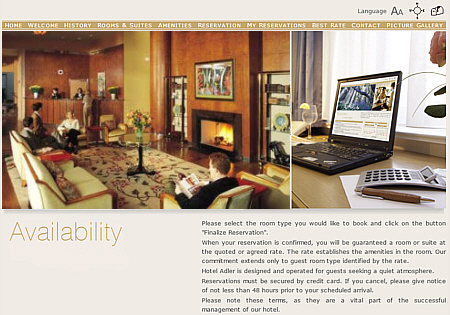 Websites designed by RSE greatly enhances the image of the property while driving reservations for the hotel. RSE design team pays special attention to property’s branding and image during the design process. Each website design is created with property’s image and target clientele in mind. Client inputs are integrated with the creativity of our design team to develop websites that tell the story that each unique property wants to communicate. Animations are used to enhance the impact of the website. The choice of navigation buttons and the placement of navigation buttons is key to keeping the visitors on a website and increasing your conversion. With our lodging industry background, we understand the key things that consumers searching for hotels are looking for. All of these factors are taken into account while designing the website. Key information items are placed in the path of the tracks that a human eye follows while scanning the website. This results in high conversion. Research is the most critical aspect of the internet marketing strategy for a property. We spend a lot of time with the property discussing their hotel, reviewing the competition, and understanding the local and regional factors. We conduct a thorough property/business analysis and develop unique selling points for the business. We do a detailed Keyword Phrase research. RSE designs each site with a customized architecture best suited to the particular client's needs. The architecture and design of the site is built to reflect the unique selling points of the property, keeping in mind the local and regional factors. We focus heavily on the simplicity, ease of navigation, and needed to convert "lookers into bookers." RSE offers custom packages to make it easier for you to decide on the features and services of your website and match your budget with your internet marketing goals.